Chicago, for so long known around the world as the home of Al Capone, is now better known as the home of President Barack Obama. Its thriving downtown and vibrant neighborhoods offer a wealth of things to see and do for the curious traveler. Two airports serve Chicago: O’Hare and Midway. Both are conveniently located on metro train lines, which are the cheapest and often the fastest way to get downtown if you don’t mind carrying your bags the last leg of the journey. The Chicago Transit Authority (CTA) offers online trackers for both trains and buses, and several mobile apps (for Android, iOS, and Windows) exist to help get you around town. Taxis can be harder to come by outside the city center — fortunately, services such as Lyft (a taxi-ordering app for iPhone and Android) and Uber (a rideshare service with smartphone apps) can help find you a ride. A good tip for navigating: Chicago’s streets are laid out on a grid, with every 800 numbers equaling a mile. Pick up a Streetwise map for easy orienteering. Downtown Chicago is dotted with hotels — the real question is which ones offer something special. The Drake and Palmer House Hilton are beautiful, historic classics, while theWit and Hotel Palomar Chicago offer a more modern experience. For the ultimate luxury, the Waldorf Astoria Chicago was named the number one large city hotel by Travel+Leisure in 2012. Chicago’s culinary scene is second to none, with restaurants serving foods from around the world, from street food to haute cuisine. Places like Alinea, Spiaggia and Girl and the Goat draw gourmands from The Michelin Guide provides a starting point for exploration, especially at the higher end, but turn to Yelp (which also has mobile apps available) for a more thorough guide replete with user-generated reviews. Blogs such as Eater and Serious Eats are good sources for the latest restaurant news, and the OpenTable (available online and as an app for iPhone or Android) can help you land reservations. 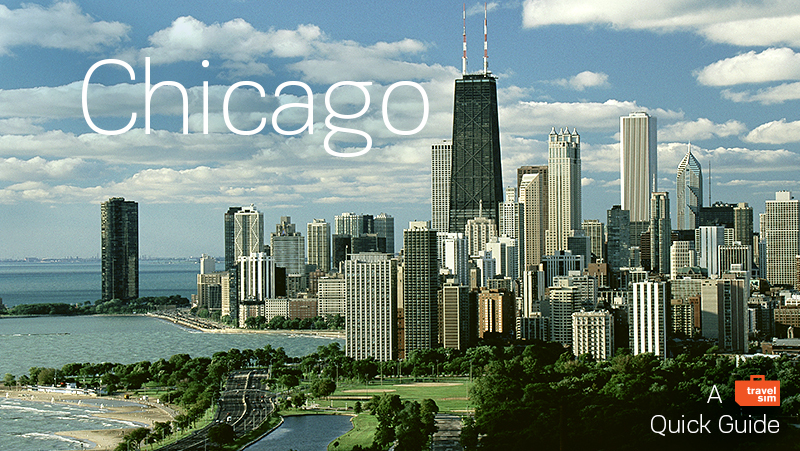 Chicago is famous for its deep dish pizza and its Chicago-style hot dogs. The dirty little secret about deep dish is that Chicagoans mostly skip it in favor of thin crust, going for the thick, heavy deep dish at Gino’s East, Pizzeria Uno or Lou Malnati’s mainly with out-of-town guests. Chicago-style hot dogs, on the other hand, are a ubiquitous local favorite, with standouts to be found at Hot Doug’s (also known for its unusual gourmet sausages), Superdawg and Portillo’s. Other indigenous dishes worth noting are the Italian beef and the jibarito, a Puerto Rican sandwich made with fried plantains in place of the bread. Chicago’s skyline bristles with architectural gems by some of the world’s greatest architects: Louis Sullivan, Frank Lloyd Wright, Bertrand Goldberg, Mies van der Rohe, just to name a few. The Chicago Architecture Foundation offers several tours every day, one of the most popular of which is the architectural boat tour, which glides along the Chicago River — itself an engineering marvel whose flow was reversed in the late 1800s. You could spend hours in the Art Institute admiring world-famous paintings by the masters, or see modern works at the Museum of Contemporary Art. ArtSlant and Chicago Gallery News guide you to the cutting edge in the River North gallery district and beyond. Music lovers may find live performances from multiple genres on any given night, from jazz at the Green Mill and blues at Buddy Guy’s Legends to contemporary rock and electronic artists at venues across the city. Do312 and the Reader provide the most comprehensive listings. Chicago is a city of neighborhoods, each with a distinctive feel, and public transportation makes it easy to move beyond the downtown area. Choose Chicago, the city’s tourism website (plus mobile apps), offers neighborhood guides, and Not for Tourists Chicago is an excellent guidebook for finding interesting shops, restaurants and cultural destinations. City blogs such as Chicagoist, Gapers Block and the Local Tourist are also great resources for off-the-beaten path events and tips on what’s going on locally.